Friday 26th: a difficult day to fit anything in, I had to content myself with walking to and from a meeting on another campus, distances to follow. Saturday 27th: dinghy sailing. If injury is a good measure of effort, then this was one of my best sessions: the tally includes bruised knees, elbows and a painful wrist that for a while I thought was broken, and some blows to the head from the boom. On one of my frequent capsizes, I hit my head on something, and the safety boat, always cautious when sailors are bleeding, towed me back to the shore. Sunday 28th: a run, at last, and the first for a week. 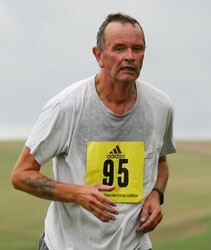 I ran up Seaford head and along the Cuckmere, in hot though cloudy conditions. My knees hurt at first, thanks to the previous day's bumps, but I was fine after a while. I hope it will be a little cooler for Bewl. On the afternoon, a very agreeable swim in the sea. A strong current ran east to west, the opposite to my last swim. On day 24, I managed to walk rather than take the bus for two trips from site to site at work, one taking me about 45 minutes,, the other taking around 25 minutes, distances, via Google maps, to follow. On day 25 88 press-ups was all I could manage. Not much to report for the 23rd day: 80 press-ups. The next couple of days are going to be difficult. Today I can manage a walk between two sites at work, but my son's concert in the evening prevents a run with the Striders. Much of tomorrow will be spent on a train, going to and from my aunt's funeral in Dorset, and Friday is taken up with work, though perhaps there will be the possibility of a walk. Saturday will be spent sailing, so no running till Sunday, when the Bewl 15 will be but a week away. As for Monday, I'll try for an evening run and on the very last day I shall be at a conference and the hotel has a swimming pool, so I can finish in style with a swim and run. Today was a difficult day: no time in the morning, evening or at lunchtime to do anything, but then I realised that, after an all-day meeting at a different site, a walk to the station from there would cover some miles. So I walked from Putney to Clapham Junction in 35 minutes, a distance Google Maps reckons to be 2.3 miles. It may or may not be midsummer today. I ran in the morning, not quite as far as I'd hoped, and swam in the sea for around ten minutes, I also did 88 press-ups. For the 20th day of Juneathon, two-thirds of the way through, I had another dinghy sailing class. This week I learnt to gybe and to capsize, in slightly cooler weather than the previous week. I think I understand it, but I need a lot more practice on the water. I now require my maily to address me as Great Helmsman. I'm unsure quite how good dinghy sailing is as a Juneathon activity. It is physically demanding yes, but not continuously, in the way that running or swimming are. Periods of exertion come in short bursts. On day 18 I managed a run, as Thursday afternoon's sunshine turned cloudy and stormy. The sea was rough and the lifeboat tossed around in the bay. And today I went for a swim at the gorgeous Pells Pool in Lewes, which claims to be the oldest outdoor pool in the country. 50 yards long, it is fed by springs, so has a bracingly agreeable temperature. I swam ten lengths as I was in a hurry. It reminds me of childhood swims at another outdoor pool, Jesus Green, though the Pells lacks the smell of urine and cigarettes and the carvings of swear words and crude, inaccurate pictures of the male and female genitalia that I remember engrained in the dark dank wood of the changing sheds. I also did 80 press-ups. I only have a feeble effort to record, 72 press-ups. There was no time for anything else, and in any case I felt awful in the close weather. It won't help with Juneathon, but I had a tour of our new building and there are showers. After we move in, in July, running at work becomes a possibility once more. I had the luxury of a morning run today, three miles exactly over Seaford Head. It should have been longer, but a run is a run. Not a distinguished day: I walked rather than take the bus to the station on the way home, about 1.8 miles, and I did the diagnostic test for the next two weeks of the 100 press-ups programme. I managed 26. We are now half way through.